In this uniquely styled documentary, the legendary naturalist Sir David Attenborough takes viewers on a cheeky late night stroll through London’s Natural History Museum, a personal favorite of his since very young. 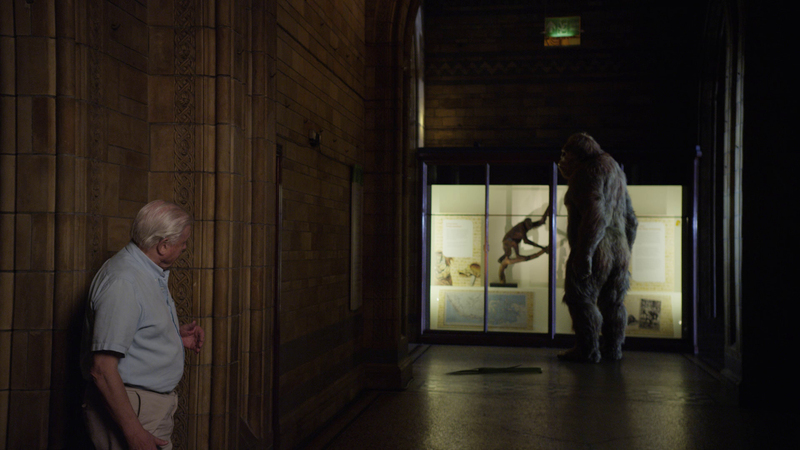 As he encounters various bones and exhibits along the way, they come to life via CGI, interacting with Attenborough and the audience through the use of 3D technology, all the while informing us of the intense research and study that has led to the foundation of specific scientific knowledge. Much like Walking With Dinosaurs: Prehistoric Planet 3D earlier this year, this is a shortened version of previously existing material, David Attenborough’s Natural History Museum Alive (2014), a well-received television special produced by Sky 3D which went on to win a BAFTA for the specialist factual category. Unlike Prehistoric Planet, though, the shortening here is a mere 15 minutes as opposed to the former’s 45, but more importantly, the material is actually a perfect fit for the huge screen format. Please don’t feed the animals … no matter how close they get! As the general concept implies, Museum Alive is very much like a factual version of Ben Stiller’s Night at the Museum (2006), but still a lot of fun, with director Daniel M. Smith not wasting a single moment of his feature debut, all too willing to have creatures look curiously out at the audience in glorious 3D. One particular shot of a giant moa, an ancient ostrich-like animal, breaking glass then peering right over the audience brought many bewildered gasps from the young ones — a reaction Smith would no doubt be proud of. The wonderful work on show here — realized through a collaboration between scientists, Natural History Museum curators and leading animation studios — means that viewers can observe various long-gone beasts in a more scientifically accurate light — Attenborough often chimes in with evidence of this, leading the living displays to morph into their more appropriate forms. As one example, a segment with a famous dodo begins from a painting that we soon find out was based on mere hearsay, the same image quickly becoming the foundation of what was thought to be a factual representation. 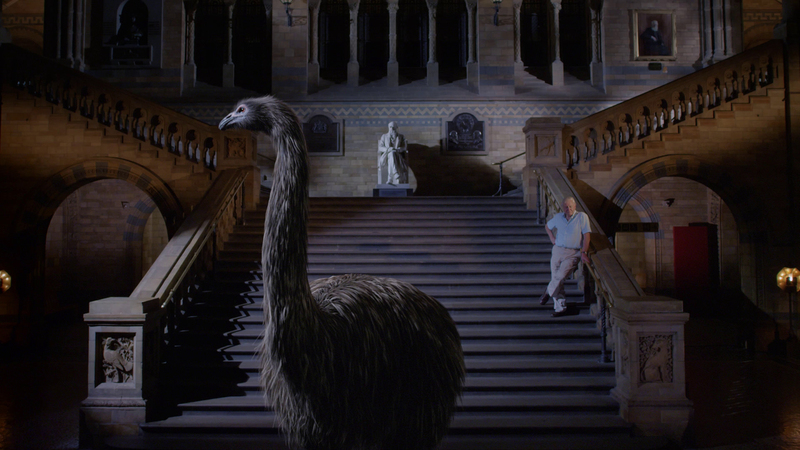 As Attenborough discusses the research-based proof to suggest a different interpretation, the CGI animal takes on a more accurate shape, all the while interacting with the intrigued naturalist as though it were a real animal living in the wild — cool, huh? As one might expect from an Attenborough doco, there are particular ideas that the Brit wants to drive home, which, not surprisingly, all revolve around the function of museums and science. More than anything, Museum Alive 3D points out how ‘we humans’ have come to understand our surroundings — and that is, by following our uninhibited curiosity, the open-source-like nature of science allowing us to alter our findings whenever new data arises. Most of all, however, Museum Alive 3D stresses the importance of gallery preservation and how its very existence inspires — the whole shebang essentially a loving tribute to the hard work of museums and the scientific community. When all is said and done, Museum Alive 3D is a welcome addition to the library of IMAX documentaries, the feature offering plenty of amusing moments interspersed with accessible scientific knowledge and humor. For the young and young at heart, there is much joyous wonder to be had here. The cherry on top is that each IMAX ticket sold during January (in Melbourne, Australia) gains patrons entry into the Melbourne Museum — literally just up the stairs from the IMAX screen. What a wonderful introduction to a day of exploration!